A Place Of My Own: Don't leave home without it..
Don't leave home without it..
My late mother used to say that my stitchings are like a milk bottle to a child. Never leave home without it. LOL! This was what I brought with me to Penang last weekend. 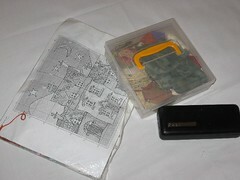 A stitching project, a hand sewing project and my reading glasses. 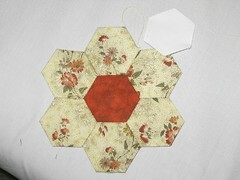 This is what I managed to complete..my first hexagon flower. So many WIPs, so little time..